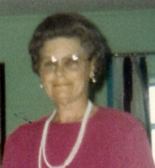 Malissie M.Bowen, 92, passed away June 14, 2014. She was the wife of the late Harry A. Bowen, Jr. Born in Coventry she was a daughter of the late Frank and Mildred (Sherman) Rathbun. Mrs. Bowen worked at Apex for over 20 years retiring in 1984 and loved arts & crafts. She is survived by two children; Judith A. Lingo Marshall and Harry A. Bowen, III, three grandchildren and two great grandchildren. Funeral service Wednesday June 18th at 10:00 am at the Hill Funeral Home, 822 Main St., E. Greenwich. Burial will be in Quidnessett Memorial Cemetery, N. Kingstown. Calling hours: Tuesday June 17th from 5-7 pm.